PAY PAL SHOPPING CART BUTTONS will be installed as soon as possible (requiring hiring a technician to do this.) This may be up to two weeks from now. (Rev. 2/14/16) Regardless, PRINTS ARE IMMEDIATELY AVAILABLE BECAUSE THEY CAN BE PURCHASED VIA THE ARTIST'S PAYPAL BUSINESS ACCOUNT, by emailing a PayPal Invoice to the Customer. CONTACT THE ARTIST: doris.starofthenorth@gmail.com. CONTINUE TO SCROLL ALL THE WAY DOWN. This Order Form can be Right-Clicked to download. Also, the ARROW ICON is activated to download. All Images with informational text on this Web Page can also be downloaded to assist in your decision-making process. All recipients of the above must leave the documentations exactly as created; alterations to these files are prohibited. Under these restrictions, duplication and distribution is permitted. 8x10 Print and Single/Double Mat Instructions. 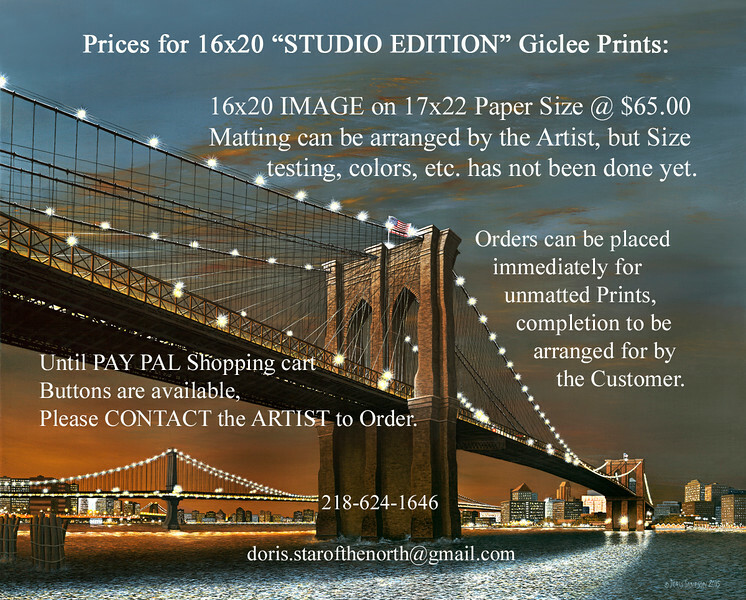 11x14 Print, and 16x20 Single/Double Mat Instructions. 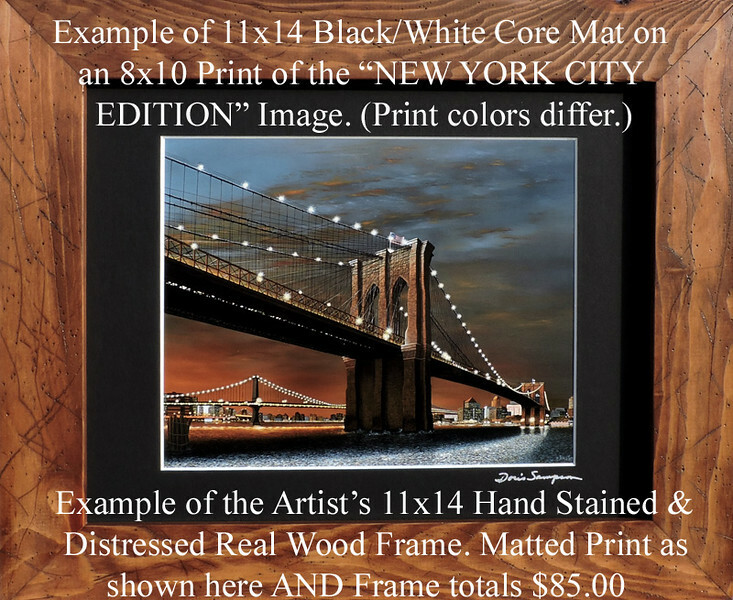 16x20 Print, and instructions regarding current availability of Matting Options; and immediate availability of Prints to ORDER. 1. 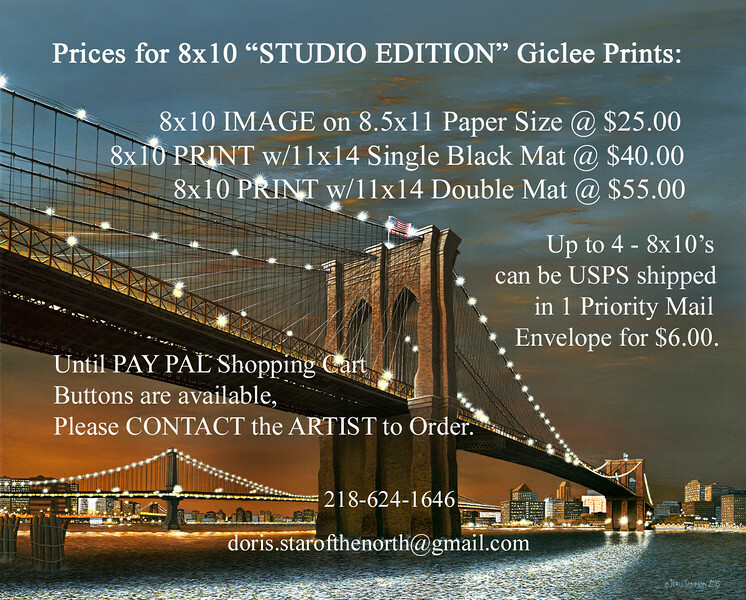 All Orders, whether NYC Edition or Studio Edition CURRENTLY MUST BE PLACED VERBALLY BY CALL, SNAILMAIL or EMAIL, to Doris Sampson, Star of the North Studio, 10 N. 58 Ave. W., Duluth MN. 55807; 218-624-1646. Email: doris.starofthenorth@gmail.com . 2. The Studio is not a storefront. For an Appointment, Visitors must CALL or EMAIL. 3. 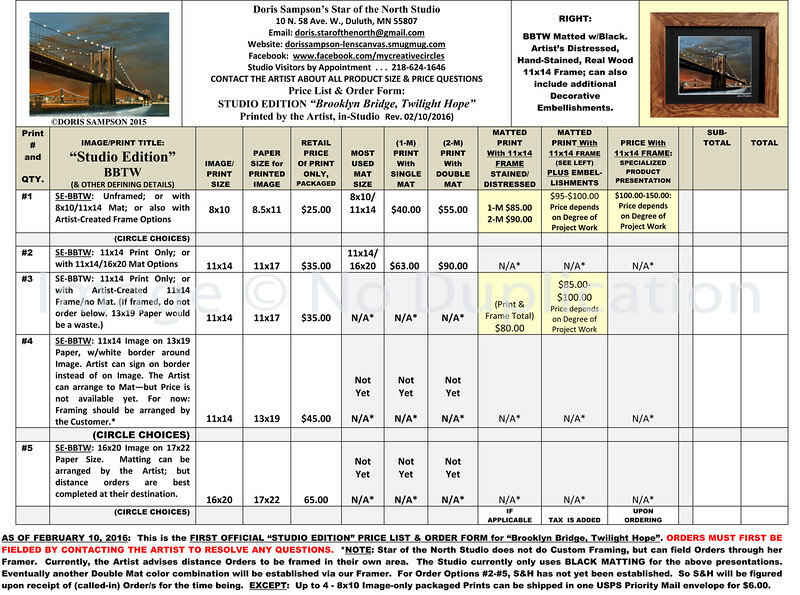 The Studio accepts Money Orders or Personal/Business Checks as Payment for Orders. Shipments are made upon confirmation of receipt of funds at the bank for Personal/Business Checks. a. The Buyer defines Order to the Studio; and the Studio confirms with the Buyer the accuracy of the Order. b. The Buyer must provide an Email Address. c.	The Studio invoices the Buyer as per the Order via that Email Address. d.	The Invoice is an official PayPal Invoice directly from PayPal, by email to the Buyer. It is not a Studio-sourced invoice. 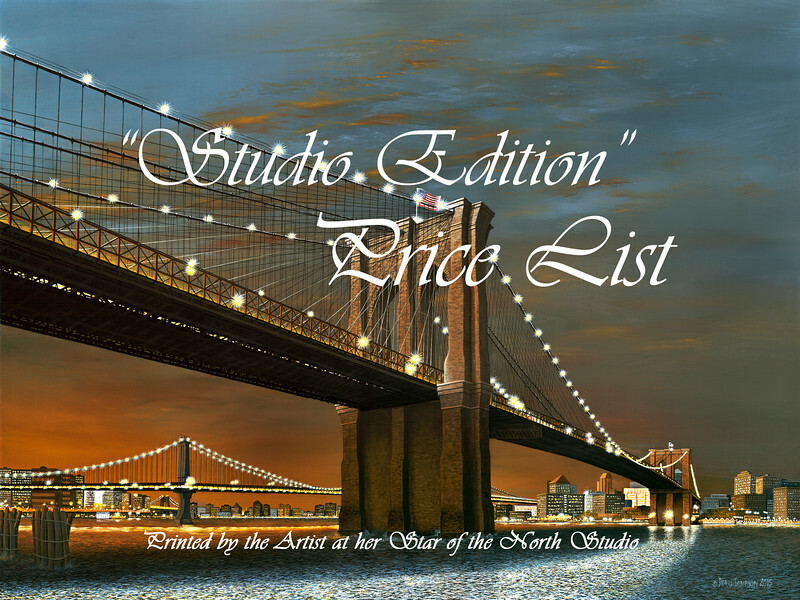 e.	The Studio never needs or sees the Buyer’s Credit Card or its Number. f.	The Buyer provides the Credit Card Number privately to PayPal. g.	PayPal only processes the Payment. h.	Both the Studio and Buyer receive confirmation of this transaction. i. It takes approximately three days for PayPal to notify the Studio that receipt of monetary payment has been received by PayPal. j. 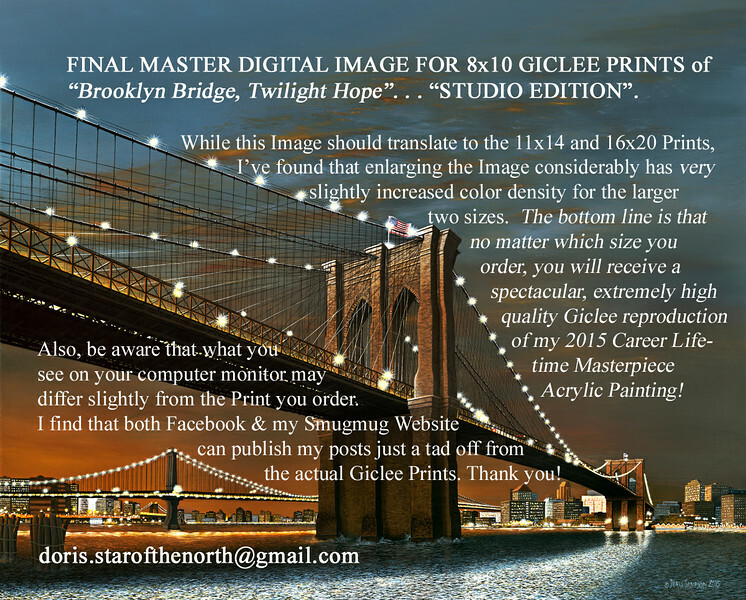 At that time the Studio releases Custom Photo Imaging to Ship “NYC Edition” Orders printed thereof. 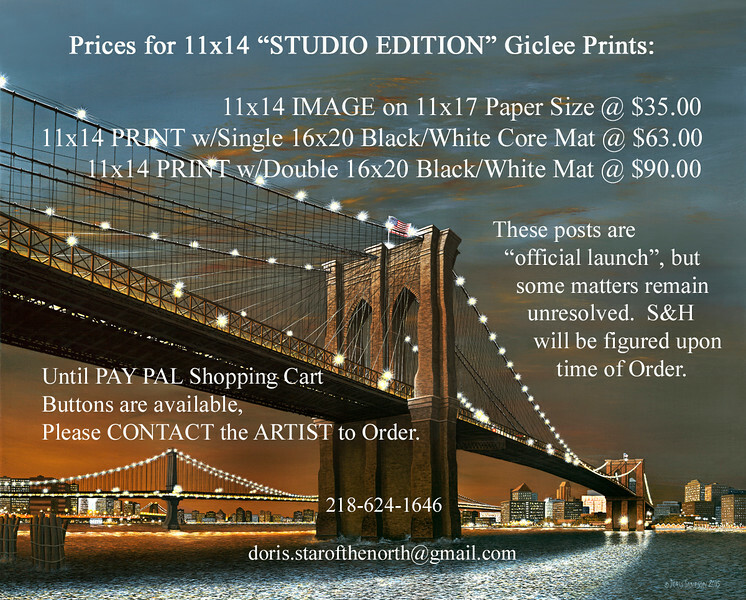 k.	Or, if the Order is Studio-printed, Doris Sampson ships “Studio Edition” Orders. 5. The Artist is building an ONLINE STORE with Shopify FOR FUTURE MORE-CONVENIENT PURCHASING. When this is ready, notifications will be made by Facebook, Email and Website: dorissampson-lenscanvas.smugmug.com . Click HOME at the top of this page. Then scroll down quickly to this Folder: BROOKLYN-BRIDGE-in-TWILIGHT. PAY PAL SHOPPING CART BUTTONS ARE AVAILABLE THERE FOR THE "NEW YORK CITY EDITION".